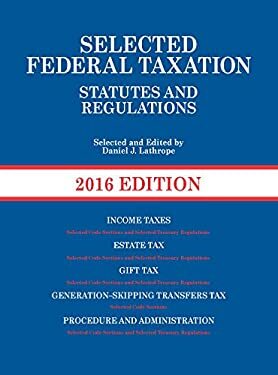 This convenient selection of federal taxation statutes and regulations is designed to provide up-to-date information for students and professors alike. It includes edited provisions of the Internal Revenue Code (IRC), Treasury regulations, and various materials prepared by the Internal Revenue Service (IRS). A staple text in law schools, this informed volume is relied upon for its consistent format and extensive coverage. Detailed sections on the Internal Revenue title and Treasury regulations discuss income taxes, estate and gift taxes, employment taxes, miscellaneous excise taxes, procedure and administration, and the generation-skipping transfer tax. Detailed appendixes and a topical index are also included. The new volume contains all relevant statutory changes made since 2014, including the changes made by The Tax Increase Prevention Act of 2014 (Pub. L. No. 116-295). IRS regulations are updated (notably, new regulations on expenses paid for lodging when not traveling away from home and regulations on allocation of basis among nonrecognition property in certain corporate transactions) and the inflation-adjusted items for 2015 are included (Revenue Procedure 2014-61, Revenue Procedure 2014-30, Notice 2014-70, and Notice 2014-79).